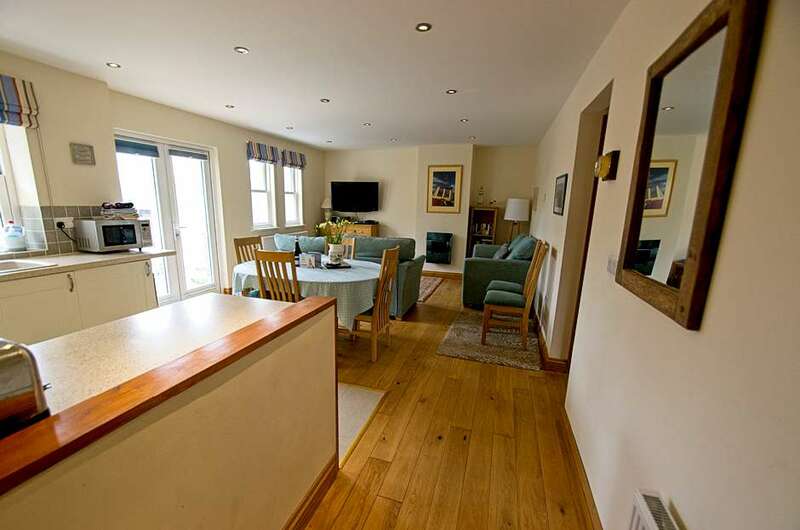 Situated in Bayview Road in Woolacombe, Rosalie enjoys a fantastic location, so near to the village with shops and places to eat and the world-famous beaches. Yet it is on a quiet private road with speed bumps just used for access to the properties there. This super two-bed apartment is part of the rear section of Parade House. It has been built and furnished tastefully to a very high standard just a few years ago having oak flooring and solid oak doors throughout. It has been designed and furnished with visitors very much in mind. Parade House, one of the first houses to be built in the village, is the former home of Miss Rosalie Chichester the 19th century founder of Woolacombe as a holiday resort. She owned most of the land in and around Woolacombe as part of her inherited Arlington Court Estate, which she gave to the National Trust in the 1940s. It is thanks to Rosalie’s gift that we can all enjoy free access for walking in the outstanding and protected coastal scenery the area provides. From the two allocated and marked off road parking spaces, entrance is through a gate and down some steps passing the charming little garden and BBQ area on the right with gorgeous sea views. Then down a few more steps to the front door and the “Surfers Room” to its left. This lockable shower room has a hanging rail for wet suits and can accommodate some surf boards depending on size (picture should give some idea), just so convenient for a holiday next to one of the finest surf beaches in the UK! Once inside the apartment it is all on one level, to the left is a useful utility cupboard with iron, ironing board, vacuum cleaner, floor mop etc. Immediately on your right is the family bathroom with bath with over shower and glass splash-screen, WC, hand basin with mirror and heated towel rail. The kitchen comprises: an open all Bosch-equipped kitchen with a built-in electric oven and gas hob, under-counter dishwasher, washer/drier, fridge, and freezer. A full range of cooking equipment and utensils is provided together with crockery, glassware, and cutlery for six people. In this area is the wall mounted gas boiler for central heating and hot water. Adjacent to the kitchen is the dining area with and extendable oak table and chairs for six people. The sitting area has two comfortable pale blue fabric covered settees and one coverts into a double sofa bed to allow the apartment to sleep 5 or 6 if required. There is an oak sideboard and matching bookcase with a number of family games, infants’ toys, reading materials, maps and details of local visitor attractions. A 37” Panasonic HD TV is swivel mounted and with inbuilt Free-sat capability and a separate Blu-Ray DVD player. Attractive lightproof blinds are fitted to the windows for the convenience of sleepers using the sofa bed during sunny dawns in the summer. There is Wi-Fi. The main bedroom has a king size bed, a generous built in wardrobe, dressing table and a wall-mounted Freeview TV. Adjacent is a fully tiled shower room with WC, heated towel rail, hand basin, and mirror with vanity shelf. The second bedroom has two single (2’6”) divan beds, a dressing table with mirror, bedside tables and a built in double wardrobe with full-length mirrored sliding doors. The apartment provides an infant’s high chair and travel cot for visitors’ use. The apartment has exclusive parking for two cars and one “visitor” space available on a first come basis. From the living area by the kitchen glazed double doors lead out to a small sunny sheltered terrace. Morning coffee or an alfresco breakfast can be enjoyed from the bistro table and chairs. This terrace south and east facing, is sheltered and can be in sunshine well into the late afternoon on summer days, weather permitting of course! On the other, western, side of the apartment is another, larger terrace with a six-seater table and chairs suitable for barbeques using the built in BBQ. The apartment also has a lovely fully securely fenced garden with a small lawn and planted beds, with views out across Woolacombe Bay. There is a small summerhouse in the garden in which some equipment is stored including the dog cage and can be used for sitting to take in the view and used as a smokers’ refuge during inclement weather. As previously mentioned, next to the front door is the lockable Surfers Room with a radiator, glass sided cubicle with a heated shower. The room has space for some secure board storage and wetsuit drying. A £150 security deposit will be pre-authorised and then released again after the holiday. The owners don't ask for an extra charge to bring a dog but £50 could be deducted from the security deposit if excess dog hair is found. Rosalie is an outstanding property, well thought out specifically for the holiday maker with a beachside holiday in mind and is so close to the village yet far enough to remain peacefully situated with plenty of outdoor options to enjoy.